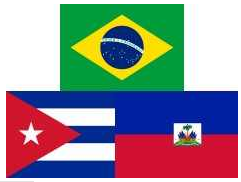 A Brazil-Cuba-Haiti Tripartite Commission was created to restore the Public Health System of Haiti after an earthquake devastated its capital, Port-au-Prince, in January 2010. Granma newspaper reported last June 8 that this alliance would contribute to the training of professionals and the building of health facilities. This same newspaper published on Thursday statements in Port-au-Prince by Carlos Felipe Almeida D’Oliveira, Project Coordinator of the Brazilian Health Ministry, who affirmed that health cooperation in Haiti runs satisfactorily. Almeida explained that the Brazilian Congress assigned an amount of 80 million dollars to be used this year and the following in different projects like the construction of these hospitals, with the assistance of Cuban experts. He pointed out that the hospitals will be located in Carrefour, Bon Repos, Tabarre and Croix des Bouquets, in the West department, very near to the capital. The project also includes the purchase of 30 ambulances, vaccines and other supplies to support the national immunization program, and the training, in two years, of 2,000 health community activists, an experience already implemented successfully in Brazil. Almeida extolled the work of the Cuban Medical Brigade, which, until last Friday, had saved the life of 69,639 Haitians infected with cholera, registering a very low lethality rate (0,39 per cent) and reporting no deaths for 34 days in a row due to that disease.